And what I like to cook at home for breakfast most days is a bowl of oatmeal prepared with cranberries or blueberries and topped with walnuts, cinnamon and some plain kefir: A perfect home cooked meal to start the day. 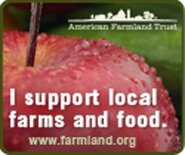 And in season, strawberry and rhubarb oatmeal is my own special creation with a recipe posted on this website a couple years ago. I’ve pondered substituting a bowl of granola and on occasion have substituted Swiss-style unsweetened muesli for the oatmeal. But a bowlful of granola in place of oatmeal? I don’t think so: Most granolas include too much added sweetener of some sort. 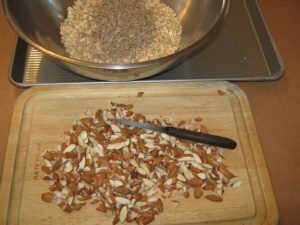 And although I’ve considered making my own homemade granola without using too much added sweetener, I just don’t see the reason to move away from my everyday healthy breakfast of oatmeal. 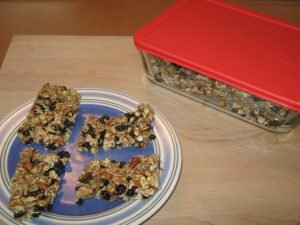 But homemade granola bars? They wouldn’t be a substitute for a healthy breakfast, but instead could be viewed as a treat of sorts in lieu of some other sweet. 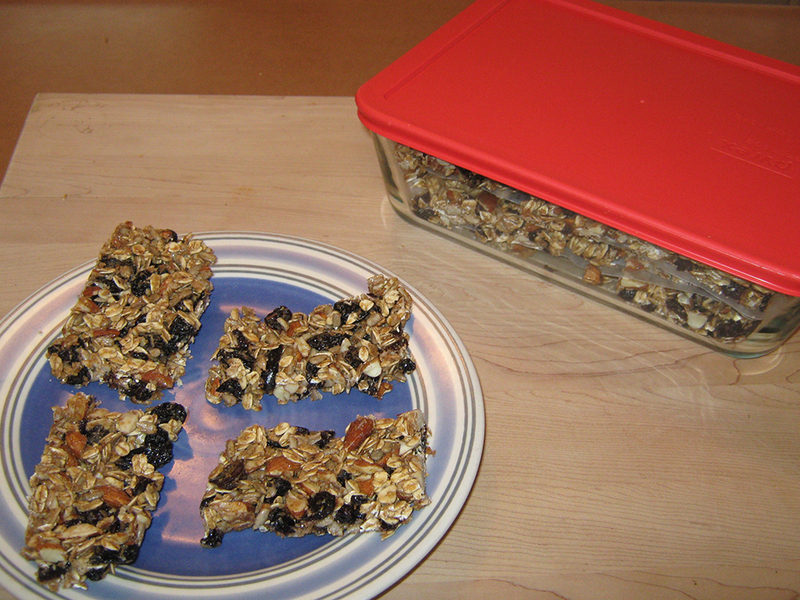 And a stockpile of granola bars would also be handy for future springtime hikes in the woods as a quick energy boost. 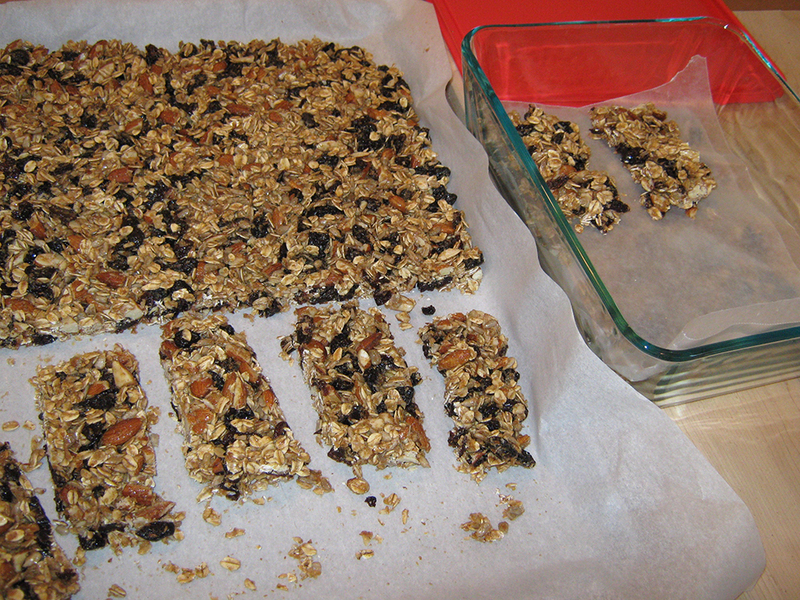 Last spring, Parks and Trails NY, on its blog, posted a recipe for Take a Hike Granola Bars, and I’ve tweaked the recipe to come up with my own recipe for Cherry Almond Granola Bars, with the delicious flavors of tart cherries and coconut to balance the sweetness of the maple syrup and honey used in the recipe. 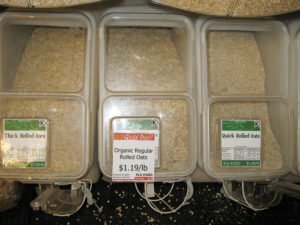 Made with organic and when possible local ingredients, I sourced nearly all of my ingredients from the remarkable Bulk Food department (with its almost 1,000 bins of bulk foods) of my food co-op, the Honest Weight Food Co-op in Albany, NY. I used maple syrup from Sweet Brook Farm in Williamstown (Berkshire County, MA) and local Rulison honey from Amsterdam (Montgomery County, NY). The flaxseed meal sold at the co-op was Bob’s Red Mill organic golden flax seed meal. Preheat oven to 350 degrees. 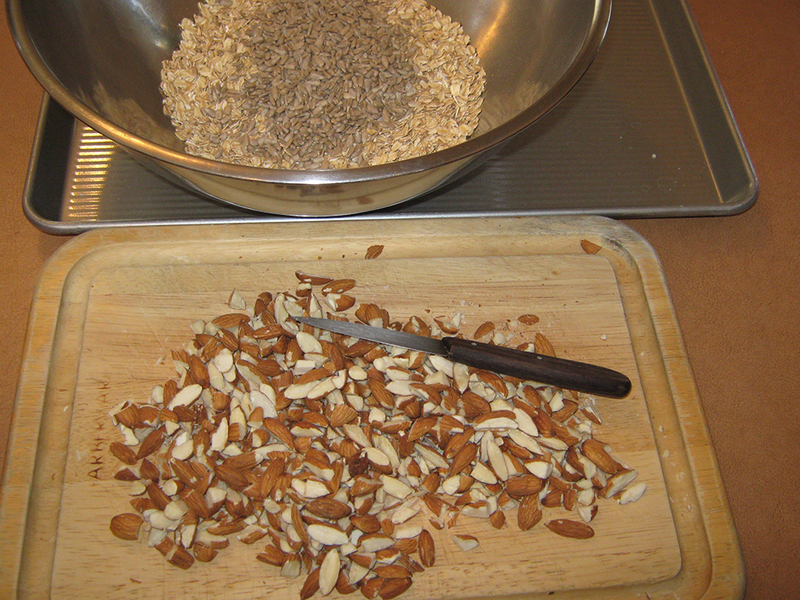 Combine in a large bowl the rolled oats, chopped raw almonds, raw sunflower seeds, flaxseed meal. Transfer to a half sheet pan and toast in the oven for 15 minutes, stirring every five minutes. In a saucepan, combine maple syrup, local honey, butter, vanilla, cinnamon, nutmeg and salt while stirring over medium heat until butter is melted and ingredients are thoroughly blended. Chop the dried tart cherries and raisins. 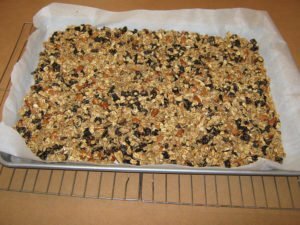 (I used unsweetened dried tart cherries and the larger sized flame raisins, both from Tierra Farms and sold in the Honest Weight’s bulk food department.) Add the oat mixture and the chopped tart cherries and raisins to the syrup mixture and stir to coat the oats well. Line a half sheet pan with parchment paper. 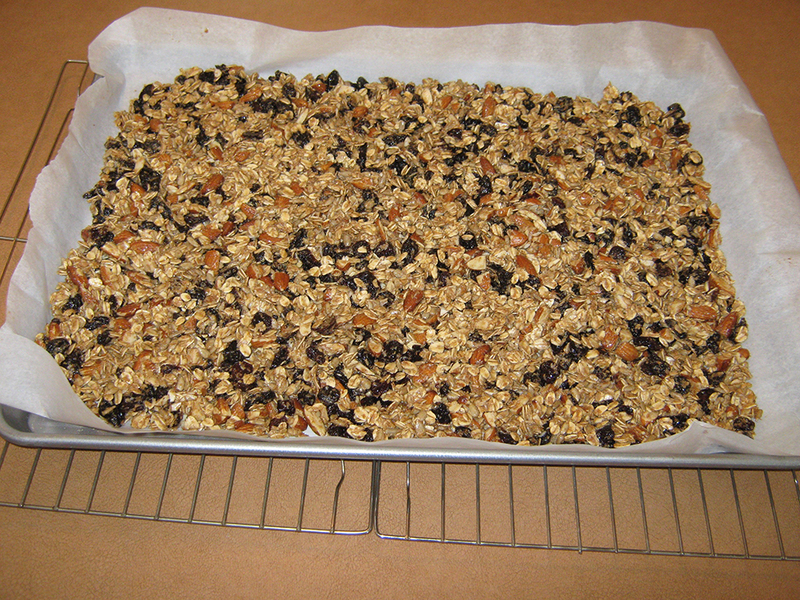 Spread the granola mixture evenly and press firmly into the pan. Bake at 300 degrees for 20 minutes. Let cool completely on a rack. Slice into bars. This recipe made approximately 30 tasty and energy boosting granola bars.